This week we come now, at last, to something that I have been referring to during all of these episodes on the action on the Italian front, the Battle of Caporetto. Caporetto was the climax of the fighting on the Italian Front during the war, I think it actually occupies the same place as the Spring 1918 Offensives do on the Western Front. The Central Powers were about to give it their all to greatly damage the Italians and to do this they would utilize large numbers of German troops. The result of this attack would be the largest gain and loss of territory during the war in northern Italy and it would almost result in complete collapse for the Italians. This week we come now, at last, to something that I have been referring to during all of these episodes on the action on the Italian front, the Battle of Caporetto. Caporetto was the climax of the fighting on the Italian Front during the war, I think it actually occupies the same place as the Spring 1918 Offensives do on the Western Front. The Central Powers were about to give it their all to greatly damage the Italians and to do this they would utilize large numbers of German troops. The result of this attack would be the largest gain and loss of territory during the war in northern Italy and it would almost result in complete collapse for the Italians. Here is Vanda Wilcox from her article Morale and Battlefield Performance at Caporetto, 1917 to give a great breakdown on the stages of the battle "The Battle of Caporetto is best understood by breaking down the month 24 October–26 November into a variety of stages. Following staff general Roberto Bencivenga, the battle can be divided into three phases: from 24 October to 3 November came the initial breakthrough and Italian rout, characterised by disorderly mass flight and desertion with huge numbers of prisoners taken as Second Army fell back on the Tagliamento, followed by the forced retreat of Third and Fourth armies to the Piave. By 3 November the situation was changing and the second phase of the battle began: though still retreating until 12 November, troops begin to reorganise, resist and fight back. The final phase of the battle, from 12–18 November, witnessed a renewed Austro-Hungarian attack, with reinvigorated efforts to break the now-stable Italian lines before the battle’s conclusion on 26 November." We will be covering Caporetto over the course of two episodes, with the first today focusing mainly on the planning and preparations for the attack, we will close out this episode with some of the initial advances as the attack began. Next week will then follow the attack through to its conclusion and then talk about what it meant for the Italian front leading into 1918. The 11th battle had been something of a wakeup call for the Austrian leaders. Emperor Karl and the new Command in Chief General Straussenberg decided to reach out to the Germans for help. To this end Karl would write to the Kaiser the following “The experience we have acquired in the eleventh battle has led me to believe that we should fare far worse in a twelfth. My commanders and brave troops have decided that such an unfortunate situation might be anticipated by an offensive. We have not the necessary means as regards troops.” The goal of both of these leaders was to have the Germans send more troops to the Eastern Front so that the Austrians could move troops to the Isonzo. The initial plan from Karl and Straussenberg specifically excluded direct German participation due to concerns about the morale of the Austro-Hungarian troops, something that was already on a razor's edge. However, this was not what the Germans wanted. The German General Staff were already looking at the Italian front as an area for action in late 1917, but instead of just letting their allies mount an offensive, something that they probably doubted their capability to do, they wanted to be involved. By involved, I of course mean they wanted to control the entire operation. Karl and Straussenberg were persuaded that this was the better plan, which in hindsight was almost certainly the correct move, and the Germans sent a group of officers to begin recon and planning for the operation. These officers included some of the very best experts in mountain warfare, something that would be critical to the upcoming operation. The attack plan would develop with the focus area around the little town of Caporetto. This was to the north of most of the fighting we have discussed on the Isonzo so far, it was north of Gorizia, the Bainsizza, and Tomein. This was an ideal area for what was being planned because it was at the start of a valley that pushed out through the mountains and out into the lowlands on the other side. This would give the attack a valley roughly a kilometer wide to make its focal point. If they were successful they would be through most of the Italian defenses, although it might expose them to attacks on the flanks if the rest of the Italian defenses held. I highly recommend that everybody check out the link to the map I put in the show notes so that you can sort of see what I am talking about. I find it interesting that the attack would take place so far away from most of the other fighting on the front. The army that would be created to take the primary role in this attack was called the 14th Army. It was created out of 7 German and somewhere between 3 and 8 Austro-Hungarian divisions. And you may be wondering why I give such a big range, well I have 4 different numbers from four different sources. Which I agree is pretty ridiculous. I think it comes down to maybe a few factual errors in terms of which Austro-Hungarian divisions they are counting. But, in all honesty, the exact number of troops doesn't really matter. Either way most of them were rounded up from other fronts and sent on their way to Caporetto. Many of these divisions were specifically selected for the task. On the German side they basically assembled all of their best mountain troops for the attack including the 117th Infantry Division which had spent a good portion of their time in the Carpathians, the 1st Wurttemberg Infantry Division, and the Alpenkorps one of the premiere units of the entire German Army. On the Austrian side the troops would be the highest quality still available to the army. The 1st Corps, under the command of a German General Krauss was heavily outfitted with specially trained and equipped assault units and they would also have the assistance of almost 450 artillery pieces, more than was made available to a single Austrians corps at any other time during the war. This 1st Corps would be the tip of the spear of the 14th army. This infusion of troops brought the Germans and Austrians as close as they would come in the last 2 years of the war to parity with the Italians. On the whole front they would still be greatly outnumbered though, however it was hoped that they would also be able to utilize troops on the Asiago to the west and on the Isonzo to the south if things really got rolling. The plan for these troops and for the attack would develop around Caporetto with the goal being of throwing back the Italians at least 40 kilometers. Just taking territory was not the measure of success for this attack though, instead the goal was to harm the Italians so much that they would have issues trying to launch an attack later in 1917 and even into the spring of 1918. This would then play into the hands of the Germans, Hindenburg, and Ludendorff who were in the opening planning stages of their Spring 1918 Western Front offensive, and they wanted to make sure their southern flank was secure. The attack would go forward in late October with the initial date being October 22nd, it would be pushed back to the 24th due to ever present weather issues. Trying to launch around this time would require a pretty quick turn around with the 22nd only being about 6 weeks after planning started. The high level concept of the attack was two pronged attack with the northern army of the attack being commanded by General Krauss. This arm would attack north of Caporetto on the slopes of Mt. Rombon and move south towards the city. To their south German General von Dellmensingen would attack from Tolmein and the bridgehead that the Austrians had over the Isonzo there. The Germans tried very hard to keep their involvement a secret, with transports only going to the front at night and units at the front begin given Austrian uniforms. They knew that it would be impossible to completely hide the presence of their troops and therefore they also played some deception games by moving some German troops to the Trentino. These effort would be at least somewhat successful. The Germans also brought their own planes, which were generally far superior to what the Italians had. These were used to keep the Italians from discovering the full scale of the build-up of troops and I am sure the Austrian infantry were ecstatic to have them on the front. One thing that you see in a lot of Austrian stories of the war is just how dominant the Italian Air Force was over the battlefield. Often the Austrians would feel completely helpless and vulnerable to attacks from the air. Of course these preparations were joined by the artillery which would play a big role in the attack. While there was rough parity between the German and Austrian guns and the Italian guns on the entirety of the front, the Italian guns were spread out everywhere, whereas their enemies could concentrate their guns, giving them a considerable advantage at the point of attack. The plan for these guns was to begin the bombardment just a few hours before the infantry attack, with the firing beginning at about 2AM with an attack time of 9AM. They would begin by hitting the Italian artillery with a new mixture of phosgene and diphenylchlorarsine gas which would then be followed by about 5 hours of traditional shelling. Once the attack went forward, and was hopefully successful, Boroevic would launch his forces into an attack which would hopefully turn into a general advance against the Italians. The operation would be given a code name, Waffentreue, or Brothers in Arms. Now let's switch over to the Italian side. Cadorna had judged that, after the effort they had put forward for the 11th battle, his army was done until 1918. In mid-September he told all of his commanders that they would not be launching any further offensives in 1917 and they should switch to the defensive and work on their positions. This put the entire army into a kind of passive and overconfident mood. They thought that with their advantage in numbers, which after the 11th battle was even more pronounced, they did not need to worry about an Austrian attack. This feeling filtered up into the commanders with even higher ranking Italians like Capello not taking defensive preparations seriously. This feeling was even worse on the norther end of the Isonzo front. After all of their failures in the north the Italians believed that the mountains north of Bainsizza would create their own defensive areas and therefore did not put as much effort into the fortifications in this area. This was of course the exact area where more effort was needed. There were also issues in this northern area due to units and commanders being frequently rotated in and out of the area, since it was seen as an inactive sector, and this created a good amount of confusion. Even with the deficiencies in their preparations the Italians still had more men than their enemies, much more if they could discover the plans for the attack and concentrate their forces, so let's talk about what they knew about the upcoming attack. This was of course the all-important question and even though the Austrians and Germans tried so hard to keep evidence of the coming attack under wraps the Italians would end up knowing a good deal. They knew that there was some kind of build-up happening on the norther Isonzo, more critically they knew that there were German troops there. However, Cadorna did not believed that the Austrians would launch an attack this late in the year, that in fact they could not launch such an attack. Therefore, while he advised his commanders to shore up their defenses he did not take any other steps to prepare for an attack. The Italians were also very backward when it came to defensive strategies by this point in the war. They did not have a ton of experience on the defensive and they still put most of their troops in the front lines, where they could easily cut off and be chewed up by the new infiltration tactics that the Germans and Austrians would be using. This was much different than the elastic defense that the Germans were using and other armies were experimenting with by this point. But it should be noted that this isn't that dissimilar from what the British were doing at this point in the war. Even when the artillery fire started Cadorna and Capello did not properly response because they were convinced that it was just a diversion from the main effort which would come later on the Carso and Bainsizza. The artillery began firing at 2AM on October 24th. The fire opened along a 30 kilometer front and on this entire front the weight of shells that were hitting their lines was greater than anything the Italians had seen. Their first targets were the artillery and the communication hubs for which they detailed about 2,000 poison gas shells. By this point in the war the Italians all had gas masked, the Austrians had already used gas a few times, and these masked were designed to protect against the most common gases, generally a mixture of phosgene and chlorine. However they were not designed to protect against the precise type of chlorine gas that the Germans were firing, which was diphenylchloroarsine. Apparently this gas was a very strong vomiting agent and could penetrate the gas masks of the time and cause the wearer to start violently sneezing. This was obviously a problem when wearing a gas mask and could allow for the phosgene to get into the mask. Whether or not this actually could penetrate a properly prepared mask seems to be up for debate, but it is possible that many Italian masks were just defective. Either way the the gas caused a serious problem with the artillery basically filling the entire Flitsch basin with the gas and it causing serious problems for the Italians. Thousands would be dead before the real artillery barrage even began. Once the gas was fired the artillery switched over to normal high explosive shells and went to work. Over the coming hours they would focus on the Italian positions and strong points and many of these would be reduced to almost nothing due to the heavy fire. The attack began early in the morning at about 8:30 and they were led by assault troops from both the German and Austrian armies. For the Austrians one of their point divisions was the 22nd, which was one that had been recruited locally and made up of troops that had no love for the Italians. They were followed by divisions like the 8th Edelwiess Division which was mostly comprised of the elite Kaiserjager. Right from the start thigs were going well. In the north the Austrians attacked and quickly pushed through the Italian positions. When they arrived at the first village objective they found that it was already completely empty. This was not even the area of greatest progress. Instead that was to the south on the Isonzo near Tolmein. Here the Germans and Austrians pushed forward below the summit of Mt. Mrzli, a height that the Italians and tried multiple times to capture. All along this sector of the front, even though they were hit by a snowstorm and sleet throughout the day, the attacks pushed along the high ground which allowed them to bypass many of the Italian strongpoints that were built at lower elevations. By noon there were German units already half way to Caporetto. Inside that town the Italian officers were desperately trying to get control of the soldiers who were retreating though the town. They had no choice but to allow anybody without a rifle to continue on their way, otherwise they would just clog up the roads. News of this policy, of course, began to filter back up the role and anybody with a rifle probably at least considered tossing them to the side so that they would be allowed to pass on. At the river near Caporetto Italian engineers were trying to rig up explosives on the bridge to slow the advance. At about 2PM the forward elements reached the edges of Caporetto and about an hour and a half later the engineers blew the bridges, this didn't slow down the advance very much though as by 4PM Caporetto had been captured. From the south the German division arrived, only to see that that town was already in Austrian hands. All around the area of the attack by nightfall all of the critical objectives, be they villages and towns or just strategic heights, were in either German or Austrians hands. The first day had been a disaster for the Italians. Somewhere around 30,000 soldiers had been captured, let alone all those that were dead or wounded. Many artillery batteries had never even fired a shot because they had no idea what was happening and never received any orders that would cause them to jump into action. This type of chaos and confusion filtered out through all of the units of the Italian second army. Abandoned equipment, weapons, artillery pieces, basically anything that could be left behind was left behind to litter the roads. On the 25th it got even worse for the Italians because the weather cleared up. Without snow and fog to slow their progress the Germans and Austrians accelerated. By the second day, after the 2nd Armies collapse accelerated, the Austrians had a new and unique problem. It was not stiffening Italian resistance, or even the logistical problems associated with an advance, instead there were just too many prisoners. This was not a common problem during the war. Even those Italian units that were resisting often found themselves surrounded with enemies both in front and behind. On the 25th as the advance continued the logistical issues did begin to mount with the infantry outrunning the artillery and their supplies. This continued even though von Below detailed more troops than was necessary to clearing out the remaining Italian units from the mountains. Many of these troups could have been bypassed without any real negative consequences, but at least he had some really good mountain troops available to make it quick. A slow down like this, coupled with outrunning the artillery, caused an attack to stall during so many other attacks during the war, but it didn't here. The reason for this was simply how broken the Italian units were, they were just not capable of providing the resistance necessary to stop the attack. 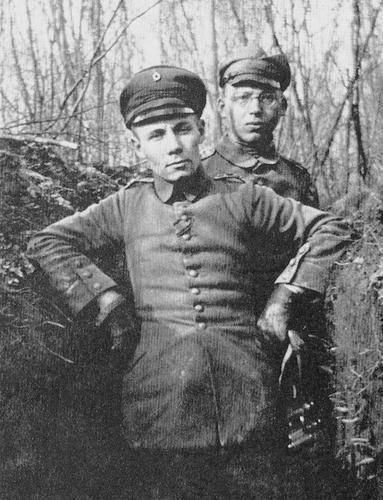 One of the units that was still advancing was the Wurttemberg Mountain Battalion, and I bring up this battalion to continue our series on famous World War 2 officers making a name for themselves in World War 1. In this Mountain Battalion was none other than the Desert Fox himself, Erwin Rommel who was at this point a lieutenant. Even after all of the action of the second world war Rommel would continue to believe that this action was the high point of his career. His discussions and portrayals of what was happening on the mountainsides make for some really good reading, even if you have to take them with at least a little bit of a grain of salt. One of his stories revolves around a few German soldiers capturing hundreds of Italians, which was not as rare of an occurrence during these days of confusion as you might think. All along the front small units of German and Austrians soldiers were capturing entire companies, battalions, and even regiments without having to fire a shot. For Cadora, the 26th would be the day that he realized that things were really started to fall apart. With such a catastrophic breakthrough happening to the north of all of the Italian troops in the south the danger of having all of the troops on the Isonzo cut off was very real and because of this Cadorna ordered a general retreat to the Tagliamento river, the never major river after the Isonzo, with the retreat to begin on the 27th. It was also this point that the Germans and Austrians planned to end their offensive, however they now needed to decide how far in they were going on this attack. Nobody really believed that the attack would be this successful, by this point in the war few believed that it was possible to precipitate this kind of complete and total collapse of an army. Because of this they were not exactly sure how much they wanted to continue. To keep the advance going would require more troops and more resources, the Austrians wanted to keep piling them in, pulling more troops from the Russian front as necessary. But Ludendorff and the Germans were less gung-ho. Von Below met with his commanders on the 26th and had to fight off suggestions that the army wheel wouth and drive for the coast. This might have trapped a good portion of the Italians that were on the Isonzo but it would have committed the Germans to a lengthy and prolonged offensive campaign. The original goal still stood, and von Below had Ludendorff's full backing on this, the Germans would drive to the Tagliamento as soon as possible, at which point the troops would be sent back to the Western Front before the end of the year. Due to their desire to stick to the original plan, at this point the Germans and Austrians would end up leaving some opportunities on the table but should nottake away the great position they were in on the 26h, they were charging forward driving the Italians in front of them, and it looked like nothing would be able to stop them. Next episode we will continue the attack, and see if the Italians could throw together anything that could.